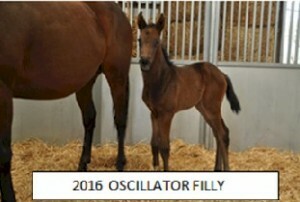 COALINGA, CA (March 15, 2016)-Harris Farms resident stallion and multiple graded stakes winner Clubhouse Ride (Candy Ride-Seeking Results, by Seeking the Gold) was represented by his first foals the week of March 7th. 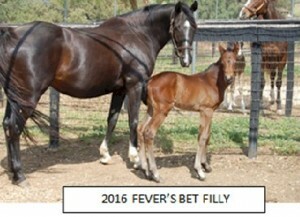 A bay filly out of Fever’s Bet (Stormin’ Fever-Castle Bet) is owned and bred by Michael Frazee and Neale Jensen, and a bay filly out of Oscillator (Decarchy-Excessive Susan), owned and bred by Rick Seidner of Six S Racing Stable. Clubhouse Ride won $1,341,142 in a 43 race career, winning the Grade 2 Californian Stakes twice and running 2nd in both the Santa Anita Handicap (G1) and the Gold Cup (G1). Trainer Craig Lewis called Clubhouse Ride” a very sound, good minded horse that loved to race and always gave an honest effort. He competed against the very best”. Clubhouse Ride is Candy Ride’s leading money winning son at stud. Candy Ride is distinguishing himself as a sire of sires through the success of his sons Twirling Candy, sire of San Felipe S. Gr 2 winner Danzing Candy, and Sidney’s Candy, sire of Palm Beach S. Gr 3 winner Converge. Clubhouse Ride stands at Harris Farms near Coalinga CA as property of Six S Racing Stable and Craig Lewis for a fee of $2,500. Inquiries should be directed to Dave McGlothlin at the farm 800-311-6211, davem@harrisfarms.com or www.harrisfarms.com.